If you’re allergic to fur and feathers, you can always resort to scales. Snakes, turtles, tortoises, and lizards of all kinds – all of these pets are non-allergenic but still offer a great deal of fun. Large and small, legged (lizards, turtles, tortoises) or legless (snakes), nocturnal or diurnal (active at night vs. during the day), carnivores or herbivores (meat vs. vegetable eaters), there are so many factors to consider if you’re planning on a reptile. With vibrant colors and varying body types, reptiles are fascinating to look at. What if you want a pet that’s responsive to you? Reptiles are still a great choice. As any reptile owner would tell you, reptiles know their owners – they respond to both their voices and their sight. They are responsive to handling and definitely appear more relaxed in their owners’ hands than in those of a stranger. When cared for properly, with the correct nutrition and environment, many reptiles can live very long lives (some turtles and tortoises can live more than 50 years!). So no need to worry if you’re allergic; there’s a reptile out there that’s just right for you. Many people who are allergic to fur are not necessarily allergic to feathers. Note, however, that some species (African gray parrots, cockatoos, and cockatiels) have a powdery white substance (powder down) on their beaks and feathers that can be allergenic to some people. But, if you don’t find yourself sneezing around birds as you do when you encounter a furry creature, then a bird might be right for you. Just as there are a variety of sizes, shapes, and colors of reptiles, the same is true for birds. You can choose from small birds that can entertain you with their singing (i.e. canaries) to large birds that can amuse you with their talking (African gray parrots and Amazon parrots). Some birds are known to be cuddly (cockatoos) while others are notorious for clowning around (caiques). Smaller birds (finches, canaries, budgerigars) are generally short-lived, while larger birds (African gray parrots, Amazons, macaws) may live for decades. Whatever bird species you choose, you can be sure that with a bird in your house, you’ll never be bored. While not completely hair-free, the hairless guinea pig certainly is much less allergy-inducing than its hairy counterpart. While some people think these little wrinkly rodents are funny looking, they are actually very cute. Guinea pigs make great pets with or without fur, so if you’re not horribly allergic and can stand being exposed to a peach fuzz amount of hair, a guinea pig may be right for you. 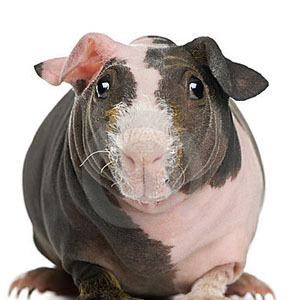 Hairless guinea pigs are friendly, very responsive, and generally love being with their owners. Other than not needing to be brushed and needing to keep them out of the sun so that they don’t burn, hairless pigs can be cared for the same way that haired pigs are. A heaping portion of hay, a small amount of vegetables, fresh water, and a daily vitamin C supplement, plus lots of attention, and you can keep a guinea pig happy and healthy. Guinea pigs are hardy and affectionate. Unbeknownst to many people, they purr and coo when they’re happy. They can make wonderful companions for nearly any family. Similar to their larger cousins, the hairless guinea pigs, hairless rats have a few sparse patches of fuzzy fur but are, for the most part, hair-free. These little hairless wonders are generally great pets for anyone with an allergy to the dander from saliva that hangs out on long hair, causing people to sneeze. They are as smart as and as endearing as furred rats and make great pets for people who want a low maintenance, short-lived pet. Living on average 2-3 years, hairless rats, like their haired counterparts, love to hang out on their owners’ shoulders, play games, watch TV, and run through mazes and tunnels. They bury, dig, and hide things and will keep their owners endlessly amused. They bond closely to their owners and often to other rats and are excellent for people looking for small, easily cared-for pets. Not the first type of animals on most people’s lists for pets, frogs and toads can make great pets if you’re more interested in watching than in handling. 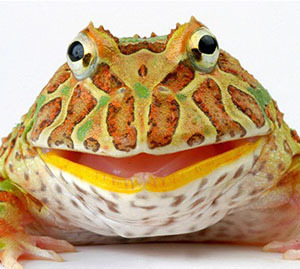 Like reptiles, amphibians lack any allergy-inducing fur and instead have a thin, delicate skin covering their bodies. From the smallest fire-bellied toads to the largest Pac-man frogs, amphibians come in all sizes and colors and are simply phenomenal to look at. With their large eyes, necks that bulge in and out as they breathe, and shiny, glistening skin, amphibians are great for people that like to study and appreciate the natural behavior of animals. Some are active during the day and others at night. In general, amphibians are not meant to be handled for fear of damaging their sensitive skin or transmitting infectious bacteria to them from our hands. Some also secrete toxins from their skin that can be irritating or poisonous if absorbed by human skin. Many eat insects and require very specific tank set-ups to be healthy. So, if you’re allergic, and you’re the type that enjoys watching nature shows on TV but would prefer seeing the real thing up close, an amphibian may be just the pet for you. As you can see from this short list of animals, there are many pet options for people with allergies to fur. It’s not the hair that makes the pet, it’s the personality. Besides, as many people say today, bald is beautiful, not just for people, but for pets, as well!